My favorites are Frontline, Bump and Jump, Phoenix, Gauntlets, Golden Axe, Captain America, Beserk, Rampage, and X-Men. Green Beret…how I hated that game. The first 10 seconds and the siren sound already make me want to not play it. Nice. It reads like it's commercial grade. Do you have to buy new boards for different games? Or do just get all of the ones on the lists. Or? You get all the ones that come on the list. So it comes with 500 games or so. You can't get the two Dungeons and Dragons games I mentioned. Some kids in the 1990's desecrated some churches and blamed it on the 2 D&D games. The company won't sell the boards because of this. Was part of the religion vs D&D back in the 80's and 90's. You can get Tower of Doom and Shadow over Mystara on other platforms but the company that owns the boards for the arcade games won't release them. That's what the guy told my wife anyhow. I always loved Teenage Mutant Ninja Turtles at the arcade. I would usually play Time Pilot and 1942 as well. Plenty of good games there. How does it work? Is it a PC in there with MAME installed? 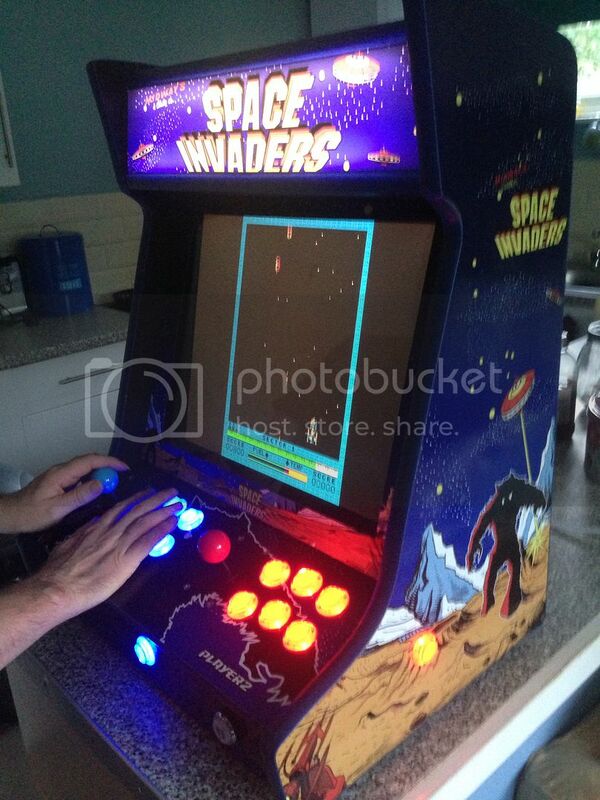 Does it have a USB port or something to let you add more ROMS? Can you just add the Mystara ROMS? It uses the actual boards from the games. It's not PC and MAME. It states they use JAMMA PCB arcade game circuit boards. It's kinda expensive but my wife and I just built a new house and it's the centerpiece for the basement. Two people can play at the same time so I expect to have some fun with Rampage and Gauntlet. … the Metal Slug series if you haven't played it before. 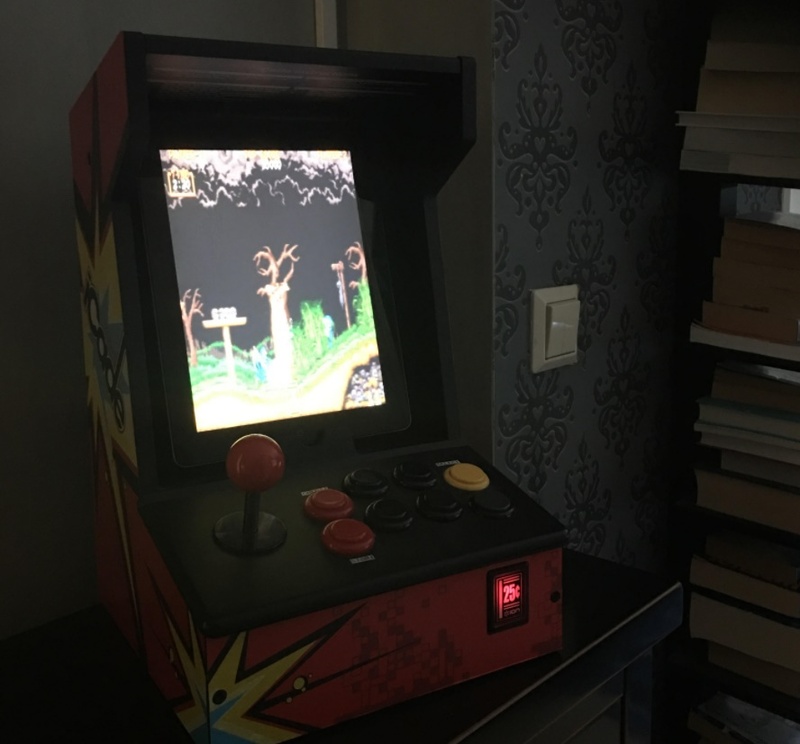 I made my own bartop (nearly complete in photo) arcade cabinet to play these old arcade games. Favourite games: Gorf, Robotron, Pacman, Astro Blaster, Phoenix, Rainbow Islands, Defender, Galaga, Donkey Kong, and about 1000 others. This thread is making me seriously jealous. How long did it take you to make the bartop machine? Last edited by Pongo; February 8th, 2018 at 12:24. About a month or so..i tend to play on it a lot more than my full sized machine. Fitting a USFF machine into it was the hardest part..lol..
looks good to me vurt!